Ford Motor Company announced this morning that when the 2015 Ford F Series Super Duty pickups begin hitting dealerships around the country, they will feature a massive new high tech turbocharger that will make the Super Duty more powerful, more capable and more efficient than ever before. The current Ford F Series Super Duty pickup powered by the 6.7L PowerStroke diesel V8 is among the most powerful engines available with 400 horsepower and 800lb-ft of torque but this monster mill falls a bit short of the 6.7L Cummins Turbo Diesel I6 that packs 385 horsepower and 850lb-ft of torque under the hood of the Ram 3500. In an effort to close that gap, Ford has revamped their PowerStroke V8 for the 2015 model year and while the Motor Company hasn’t quoted any exact power figures for the 2015 Super Duty – Ford has promised that the new PowerStroke will offer more power than the current heavy duty diesel engine. To help beef up the 2015 Ford F Series Super Duty, Ford engineers made a variety of changes to the tried and true 6.7L PowerStroke diesel V8 that would not only make it more powerful but this new engine is also more efficient and more durable than the outgoing version. The most significant upgrade is the new GT37 turbocharger that sits atop the engine in a unique layout that helps to maximize the efficiency of the whole system. The GT37 turbo unit features a larger, single sided 88 millimeter compressor setup that replaces the smaller dual compressor setup that is used on the current Super Duty diesel engines. The “hot” side of the turbo that uses the escaping exhaust gases to spin the compressor wheel has also been increased in size, jumping from 64 millimeters in the current PowerStroke V8 to 72.5 millimeters in the 2015 models. This larger turbine creates more surface area for the exhaust gases to spin the turbo and more spin equals more boost…and more boost equals more power. At the same time, Ford expects that this new 2015 Super Duty engine will offer best in class fuel economy among diesel engines while also being one of the most powerful. 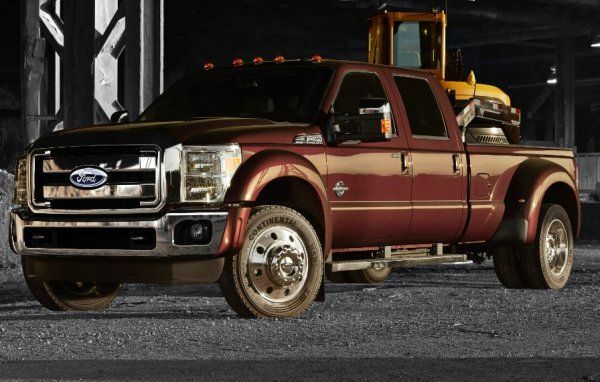 To deal with the added stress of the larger turbo and increased power, the 6.7L PowerStroke V8 in the 2015 Ford Super Duty also features an enhanced fuel system to help feed this hungry engine. This includes a new high pressure fuel pump and new fuel injectors to help deliver more fuel to the engine while new fuel injector tips that allow the engine to make better use of the fuel. Ford expects that this new fuel system and turbocharger work together to offer less engine emissions, less noise and less inner-engine carbon buildup. Finally, to help make the revised 6.7L PowerStroke diesel engine more durable under the added load of the increased power, the 2015 Ford F Series Super Duty will receive polymer coated main bearings, a revised crankshaft design, a new crankshaft damper, five layer head gaskets, four later exhaust manifold gaskets, stronger pistons, a revamped turbocharger oil and coolant delivery system, beefier cylinder heads and a revised six speed automatic transmission with a stronger torque convertor to handle the bigger power. Although Ford hasn’t announced the actual power outputs for the new 6.7L PowerStroke diesel V8 engine for the 2015 Ford Super Duty, I would guess that the torque output will be somewhere in the range of 875-900lb-ft of torque with horsepower numbers in the 425-450hp range. This would make the Super Duty the most powerful consumer truck sold in America – at least until General Motors or Ram upgrades their diesel engine to climb to the top of the hill.